New year, and more resolutions? ─ “mais, oui!” Evading déjà vu ─ or not ─ fulfilling delicious goals via classical desserts promises to be the ‘solution’ to make, and keep this year. In pursuit of a sweet-er life, I start 2015 right with my very own wheel of fortunately scrumptious Paris-Crest. French pastry sounds divine, and is nothing to be feared. So, pause and pace yourself. If you feel overwhelmed and want to back out of this baking feat, consider this: despite its sophisticated appearance, yielding celebratory bites of ‘fancy’ are more than likely, as long as one adheres to outlined procedures ─ no shortcuts. Quest ─ presumably ─ settled, let’s get baking! Between gleaming éclairs, towering croquembouche, or layered St. Honoré cake, I’m ready to tackle profiteroles. After all, there’s something to be said for understated beginnings. And regardless of desired dessert, the start of all the above encased indulgences boil down to preparation and use of the same enriched, glossy, and light dough ─ choux pastry. Remember: fret not, get organized and stay golden! Recreating the very possible Paris-Crest is a breeze, and practically half-way done with advance preparation. 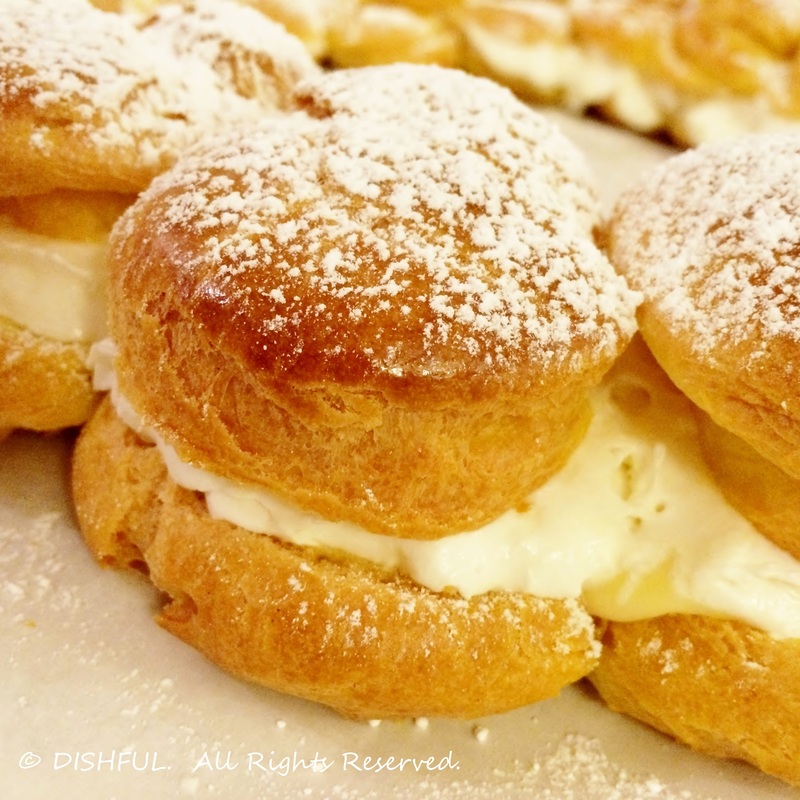 Separate batches of pastry and homemade fillings once made, scoop choux contents into a piping bag while refrigerating the creamy whip and silky custard. In continuance, pipe 16 pastry rounds onto a parchment-lined baking sheet, and brush each circular surface with a coating of egg-wash ─ essentially, a prelude of shiny ‘ringed’ domes to come. Skipping no step, this sweet bread should bake to an expansive state, and ultimately reveal a hollow interior. Post-cooling, use a serrated knife to slice the pastry wreath ─ horizontally ─ and proceed by filling the bottom layer with a spoonful of pastry cream in addition to a generous piping swirl of sweetened whipped cream. To finish, cover the filled dessert with the second half of baked pastry. For a final touch, decorate the ‘cupolas’ of this gorgeous circular structure with a heavy dusting of confectioner’s sugar. ‘Et voilà,’ there you have it ─ abundance at its best! Equally befitting for any occasion, Paris-Crest is more than a delicate round of cream-filled ‘clouds’ ─ it’s the ‘crowning’ reward for a mission thoroughly accomplished. © DISHFUL, 2015. All Rights Reserved.